This is the perfect cozy treat to share with friends and family this time of year. And if you're concerned about children drinking caffeine, I share an easy tip for how to decaffeinate the tea leaves — so everyone can partake! If desired, decaffeinate black tea leaves by steeping in water just off the boil for 3 minutes. Then discard water and set aside tea leaves. They're now 40% to 70% less caffeinated — but still flavorful! Add water to saucepan and bring to simmer over medium-low heat. Meanwhile, combine cardamom, peppercorns, cloves, anise seeds, and cinnamon bark in mortar and pestle. Crush until peppercorns are cracked and cardamom pods are opened to reveal the seeds. Maintain a simmer for 10 to 15 minutes, or longer, to your desired strength. Strain. Add milk and honey to tea and stir well. Bring to desired drinking temperature, then take off the heat. 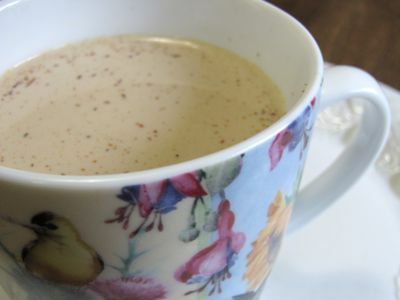 Pour tea into each tea cup, then sprinkle with nutmeg (if desired). Enjoy! 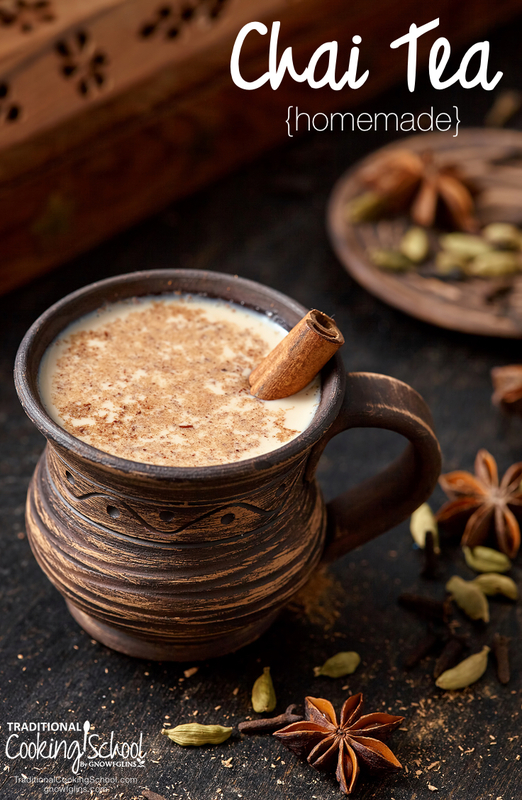 Do you make your own chai tea? I absolutely LOVE Chai Tea! Thanks for the great recipe! It sounds delish, can’t wait to try! Megan, I think you’ll really like this. I’m enjoying a cup right now. Yumm…. 🙂 P.S. I had no idea you had a blog! I just subscribed. Yum Wardee! I have all those spices – just not black tea. I’m thinking of ordering some stuff from Mt. Rose to make Christmas gifts so I’ll add on some black tea. I just can’t buy bags of tea this year, it seems so commercial to me now. 🙂 and I didn’t get the chammomile & raspberry leaves harvested in time either…next year I’ll be on top of my entire harvest. I suppose I should sit back and be appreciative of all I did get done. It was a busy year! .-= Sustainable Eats´s last blog post… Dark Days Challenge =-. I made chai tea last year when I was pregnant, and used rooibos instead of black tea because of the tannins in black tea. It was just as good! Rebecca – That’s a great point to make! Thanks for sharing that alternative! I’ve changed how I make this, to make cleanup easier. 🙂 I now boil the tea leaves and spices with just the water for a good 10 minutes. Then I strain out the solids and combine the tea water with the milk and honey, which I bring to desired heat and then serve. Michelle – I think coconut milk would be a nice substitution for someone who is dairy free – though if it is whole coconut milk, thin it down to drinkable consistency.